Karen's practice focuses on Colorado water law, which involves assisting clients with acquiring, adjudicating, changing, protecting, and augmenting water rights, as well as establishing wetland mitigation banks, ditch easements, and related approvals, permits, transactions, and litigation. She also assists clients with the water rights components of real estate transactions, including deeds and chain of title research to verify ownership. Karen graduated from Vermont Law School with a Juris Doctor in 2007 and received a Masters of Studies in Environmental Law in 2008. While at Vermont Law School, Karen served as the managing editor of the Vermont Journal of Environmental Law and was a member of the Dean’s list. 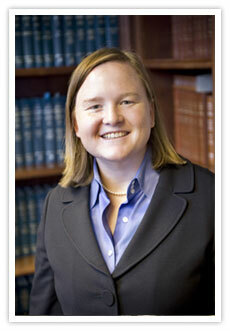 During law school, she clerked for Patrick Miller & Kropf, P.C. in Aspen, CO and Trout Unlimited in Boulder, CO. Before going to law school, Karen completed her undergraduate studies at Colorado College and graduated in 2002 with a Bachelor of Arts in English and a minor in Journalism. While at Colorado College, she was editor-in-chief of the student newspaper, The Catalyst, and was a member of the Dean’s list. Karen grew up in Texas and spent time exploring her grandparents' cattle ranch, the oil and gas operations on-site, and interacting with the local wildlife. Karen developed a love for the mountains and backcountry travel during her summers at Cheley Colorado Camps in Estes Park, CO and during a National Outdoor Leadership School (NOLS) course in New Zealand. Her love of maps, the outdoors, and research led to a passion for water law. Karen enjoys the historical aspect of water rights and working with clients on all water related matters. Karen has been with the firm since September of 2007, and has had several titles within that time period (law clerk (09/2007 - 12/2007), associate (01/2008 - 12/2015), partner (01/2016 - 08/2018), and of counsel (09/2018 - present). Admitted to the Colorado bar in 2007 and both the U.S. District Court for the District of Colorado and the Court of Appeals, 10th Circuit in 2011. Karen was named to the Colorado Rising Stars list in 2014 and 2018 by Super Lawyers, a Thomson Reuters business. The Rising Stars list recognizes Colorado’s top up-and-coming legal talent. No more than 2.5% of attorneys in Colorado are named to the Rising Stars list. Speaker, Interplay between Water & Environmental Law: Waters of the U.S. and the Endangered Species Act Going Forward, 15th Annual Colorado Water Law Conference held in Denver, CO on June 9, 2017. Regulating Produced Water as an Alternative Water Supply in Colorado, 2007. Co-Author with Scott C. Miller, "Colorado Groundwater Management, Conjunctive Use and Water Banking," 10 Western Water Law & Policy Reporter 125, March, 2006.